Backup is incredibly important. Obviously there's no best backup tool, but a comparison of the options would be very interesting. Install method: In standard repositories? PPA? DÃ©jÃ Dup is (from Ubuntu 11.10) installed by default. It is a GNOME tool intended for the casual Desktop user that aims to be a "simple backup tool that hides the complexity of doing backups the Right Way". It is a front end to duplicity that performs incremental backups, where only changes since the prior backup was made are stored. It has options for encrypted and automated backups. It can backup to local folders, Amazon S3, or any server to which Nautilus can connect. Note that as of February 2016 this project appears to be almost completely ignoring bug reports with only minor triage activity and the last bugfix dates back to 2014, though there are new releases with minor changes. I have been using Back in Time for some time, and I'm very satisfied. 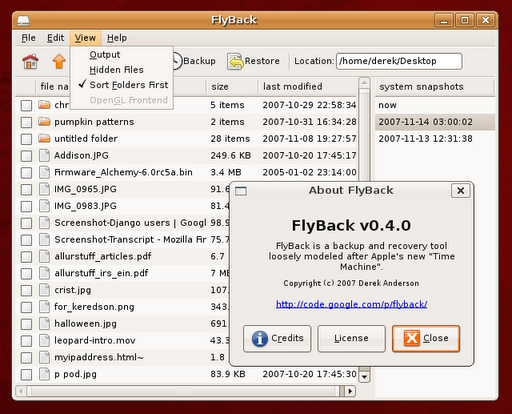 The program GUI can be opened via ubuntu search for "backintime". Project is active as of May 2017. If you're familiar with command-line tools, you can use rsync to create (incremental) backups automatically. It can mirror your directories to other machines. There are lot of scripts available on the net how to do it. Set it up as recurring task in your crontab. There is also a GUI frontend for rsync called Grsync that makes manual backups easier. In combination with hard links, it's possible to make backup in a way that deleted files are preserved. Duplicity backs up directories by producing encrypted tar-format volumes and uploading them to a remote or local. It uses librsync to record incremental changes to files; gzip to compress them; and gpg to encrypt them. Duplicity's command line can be intimidating, but there are many frontends to duplicity, from command line (duply), to GNOME (deja-dup), to KDE (time-drive). A cross-platform (proprietary) cloud sync for Windows, Mac, and Linux. 2GB of online storage is free, with paid options. Advertised as a way to "store, sync, and, share files online" but could be used for backup purposes too. Note that even on paid accounts revision history is limited to one year and on free accounts it is only one month. 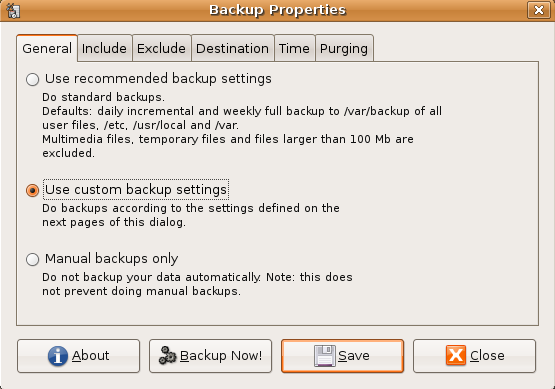 It's not been mentioned before, so I'll pitch in that "LuckyBackup" is a superb GUI front end on rsync and makes taking simple or complex backups and clones a total breeze. Note that this tool is no longer developed. CrashPlan is an award-winning endpoint backup solution providing unlimited data protection on all laptops and desktops for businesses of any size. I had considered a bunch of options and configurations (using rdiff-backup, duplicity, backup-ninja, amazon s3, remote server). What it finally came down to was simplicity. CrashPlan is cross platform, but not open source. There is a charge if you use their servers to host your backup, but you can also backup to a folder (or drive), another computer you own, or a computer of someone you know. Or any combination of those. It's also worth noting that with a (paid) CrashPlan Central 'family' plan you can backup all the computers you own. I used Bacula a long time ago. Although you would have to learn its architecture, it's a very powerful solution. It lets you do backups over a network and it's multi-platform. You can read here about all the cool things it has, and here about the GUI programs that you can use for it. I deployed it at my university. When I was looking for backup solutions I also came across Amanda. One good thing about Bacula is that it uses its own implementation for the files it creates. This makes it independent from a native utility's particular implementation (e.g. tar, dump...). When I used it there weren't any GUIs yet. Therefore, I can't say if the available ones are complete and easy to use. A "highly efficient file backup system based on the git packfile format. Capable of doing fast incremental backups of virtual machine images." Simple Backup is another tool to backup your file and keep a revision history. It is quite efficient (with full and incremental backups) and does not take up too much disk space for redundant data. So you can have historical revision of files Ã -la Time Machine (a feature Back in time - mentioned earlier - is also offering). A dropbox like backup/syncing service with comparable features. Free accounts have unlimited revision history. DAR - the Disk ARchive program - is a powerful command line backup tool supporting incremental backups and restores. If you want to backup a lot of files then it may be considerable faster than rsync (rolling checksum) like solutions. Attic requires Python >=3.2. Besides Python, Attic also requires msgpack-python and OpenSSL (>= 1.0.0). In order to mount archives as filesystems, llfuse is required. There is also now a fork of Attic called Borg. is also a very decent GPL program to make backups easily. Is a winner as far as I'm concerned. It backs up remotely to an optionally-encrypted Amazon S3 bucket, it's customisable, it can run in the background (there are various guides available for setting that up). There's a decent UI or you can hack an XML file if you're feeling so inclined. I backup all of my home machines with the same account, no problem. I also can remotely access my backed-up data via myjungledisk.com . It's not free, but in US terms it's certainly cheap enough (I pay around $7 a month). I feel that's more than acceptable for an offsite backup where someone else deals with hardware and (physical) security etc issues. I had some custom needs as well. Because I have multiple massive (e.g. 60GB) VirtualBox disk images, I only ever wish to have one copy of those, not snapshot versions. Even a 1 or 2 TB HDD has limits. 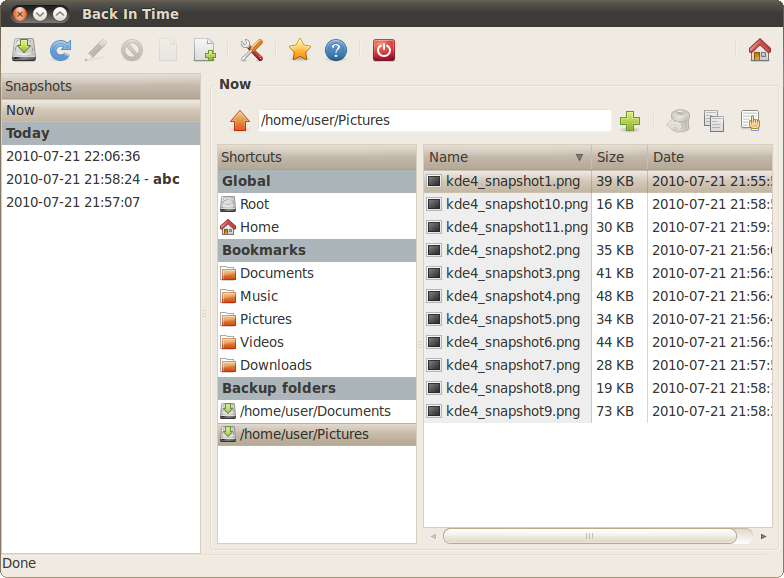 TimeVault a is tool to make snapshots of folders and comes with nautilus integration. Snapshots are protected from accidental deletion or modification since they are read-only by default. The application is currently in beta stage and can be downloaded from Launchpad. Dirvish is a nice command line snapshot backup tool which uses hardlinks to reduce diskspace. It has a sophisticated way to purge expired backups. An open source, gratis backup application running on Linux, with gui that "securely stores encrypted, incremental, compressed backups on cloud storage services and remote file servers. It works with Amazon S3, Windows Live SkyDrive, Google Drive (Google Docs), Rackspace Cloud Files or WebDAV, SSH, FTP (and many more)". Version 1.0 is considered stable; there is a version 2 in development with considerable internal changes that is currently working (though I wouldn't use it for production). There are standard or custom filter rules to select files to backup. I have been using it for years partly (not connected to anyone there but have considered looking at the API to add a backend, speaking as a developer) although infrequently, on both a Windows laptop and my Ubuntu 14.04 install. A Python script that offers a more-or-less real-time backup capability. "I came across a reference to the âinotifyâ feature that is present in recent Linux kernels. Inotify monitors disk activity and, in particular, flags when files are written to disk or deleted. A little more searching located a package that combines inotify's file event monitoring with the rsync file synchronization utility in order to provide the real-time file backup capability that I was seeking. The software, named inosync, is actually a Python script, effectively provided as open-source code, by the author, Benedikt BÃ¶hm from Germany (http://bb.xnull.de/)." PING is a no-nonsense free backup tool that will let you make backups of entire partitions. It is a standalone utility that should be burnt on CD. What I like about this program is that it copies the entire partition. Imagine this: while modifying your Ubuntu as a superuser, you changed a vital part and Ubuntu won't start up anymore. You could format the hard disk and reinstall Ubuntu. 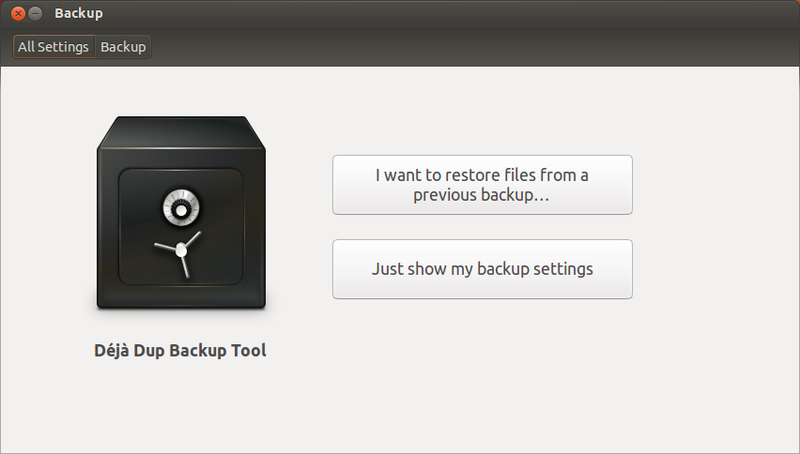 While backup solutions as Dropbox, Ubuntu One etc. might be useful for retrieving the important files , it won't restore your wallpaper, Unity icons and other stuff that made your Ubuntu the way you liked it. Another option is to ask for help on the internet. But why not just restore the whole system to the way it was a few days ago? PING will do exactly this for you. An excellent Dutch manual can be found here. s3ql is a more recent option for using Amazon s3, Google Storage or OpenStack Storage as a file system. It works on a variety of Linux distros as well as MacOS X. Using it with rsync, you can get very efficient incremental offsite backups since it provides storage and bandwidth efficiency via block-level deduplication and compression. It also supports privacy via client-side encryption, and some other fancy things like copy-on-write, immutable trees and snapshotting. See Comparison of S3QL and other S3 file systems for comparisons with PersistentFS, S3FS, S3FSLite, SubCloud, S3Backer and ElasticDrive. I've been using it for a few days, starting from s3_backup.sh, (which uses rsync) and am quite happy. It is very well documented and seems like a solid project. 'Obnam is an easy, secure backup program. Backups can be stored on local hard disks, or online via the SSH SFTP protocol. The backup server, if used, does not require any special software, on top of SSH. Snapshot backups. Every generation looks like a complete snapshot, so you don't need to care about full versus incremental backups, or rotate real or virtual tapes. Data de-duplication, across files, and backup generations. If the backup repository already contains a particular chunk of data, it will be re-used, even if it was in another file in an older backup generation. This way, you don't need to worry about moving around large files, or modifying them. An old version can be found in the Ubuntu software sources, for the newest version refer to Chris Cormacks PPA or Obnams website. 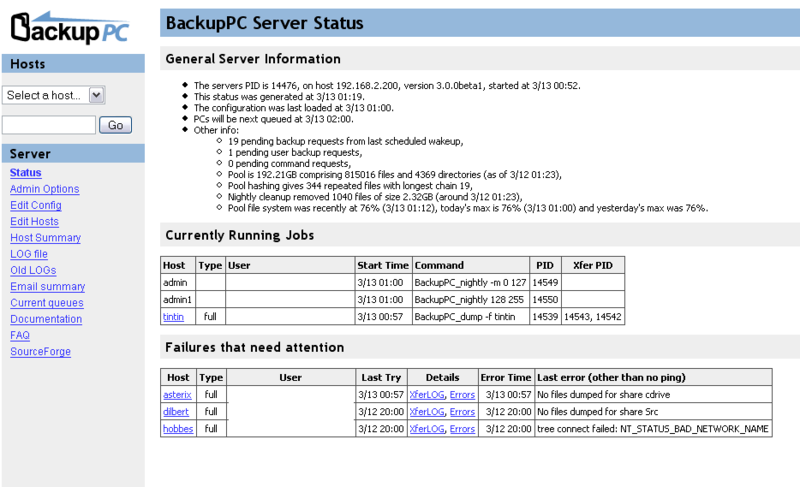 Another small tool which lets you do incremental backups with hardlinks is faubackup. Four different backup-types are recognized: daily, weekly, monthly and yearly. The first existing backup in such an interval will be considered belonging to the coresponding type. Thus, the first backup in a month (eg. 2000â'12â'01@06:30:00) will be a monthly backup; the first backup in 2001 will be of all four types, as January 1st, 2001 is a Monday.